Powys (/ˈpoʊɪs, ˈpaʊɪs/; Welsh: [ˈpowɪs]) is a principal area and county, and one of the preserved counties of Wales. It is named after the Kingdom of Powys which was a Welsh successor state, petty kingdom and principality that emerged during the Middle Ages following the end of Roman rule in Britain. See the list of places in Powys for all towns and villages in Powys. Powys covers the historic counties of Montgomeryshire and Radnorshire, most of Brecknockshire (Breconshire), and a small part of Denbighshire – an area of 5,179 km² (2,000 sq miles), making it the largest unitary authority in Wales by land area and about the same size as the country of Trinidad and Tobago. 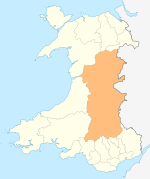 It is bounded to the north by Gwynedd, Denbighshire and Wrexham; to the west by Ceredigion and Carmarthenshire; to the east by Shropshire and Herefordshire; and to the south by Rhondda Cynon Taf, Merthyr Tydfil, Caerphilly, Blaenau Gwent, Monmouthshire and Neath Port Talbot. The majority of the Powys population lives in villages and small towns. The largest towns are Newtown, Ystradgynlais, Brecon, and Welshpool with populations of 12,783, 9,004, 7,901 and 6,269 respectively (2001). Powys has the lowest population density of all the principal areas of Wales. Most of Powys is mountainous making north-south transport difficult. Just under a third of the residents have Welsh linguistic skills: Welsh speakers are concentrated mainly in the rural areas both in and around Machynlleth, Llanfyllin and Llanrhaeadr-ym-Mochnant (where William Morgan first translated the whole Bible into Welsh in 1588) in Montgomeryshire (Welsh: Sir Drefaldwyn), and the industrial area of Ystradgynlais in the southwest of Brecknockshire (Welsh: Sir Frycheiniog). Radnorshire (Welsh: Sir Faesyfed) was almost completely Anglicised by the end of the 18th century. The 2001 census records show 21% of the population of Powys were able to speak Welsh at that time, the same as for the whole of Wales. The county is named after the ancient Welsh Kingdom of Powys, which in the sixth century AD included the northern two thirds of the area as well as most of Shropshire and adjacent areas now in England, and came to an end when it was occupied by Llywelyn ap Gruffudd of Gwynedd during the 1260s. The uplands retain evidence of occupation from long before the Kingdom of Powys, and before the Romans, who built roads and forts across the area. There are 1130 identified burial mounds within the county, of varying styles and ages, dating from 4000BC to 1000BC, most of them belonging to the Bronze Age. Of these, 339 are Scheduled Monuments. Standing stones, most again dating to the Bronze Age, also occur in large numbers, 276 being found across the county, of which 92 are scheduled. From the Iron Age, the county has 90 scheduled Hill forts and a further 54 enclosures and settlement sites. The gold in the county coat of arms symbolises the wealth of the area. Black is for both mining and the Black Mountains. The fountain is a medieval heraldic charge displayed as a roundel barry wavy Argent and Azure. It represents water, and refers to both the water catchment area and the rivers and lakes. Thus, the arms contain references to the hills and mountains, rivers and lakes, water supply and industry. The crest continues the colouring of the arms. A tower has been used in preference to a mural crown, which alludes to the county's military history and remains. From the tower rises a red kite, a bird almost extinct elsewhere in Britain but thriving in Powys. The bird is a "semé of black lozenges" for the former coal mining industry while the golden fleece it carries is a reference to the importance of sheep rearing in the county. The county motto is: Powys – the paradise of Wales (Welsh: Powys Paradwys Cymru). Powys was originally created on 1 April 1974 under the Local Government Act 1972, and originally had Montgomery and Radnor and Brecknock as districts under it, which were based directly on the former administrative counties. On 1 April 1996, the districts were abolished, and Powys was reconstituted as a unitary authority with a minor border adjustment in the northeast—specifically, the addition of the communities of Llansilin and Llangedwyn from Glyndwr district in Clwyd—and with moving the border, so that rather than half of Llanrhaeadr-ym-Mochnant, all is included. The first Lord Lieutenant of Powys was previously the Lord Lieutenant of Montgomeryshire. The Lord Lieutenant of Brecknockshire and Lord Lieutenant of Radnorshire were appointed as Lieutenants. The present Lord Lieutenant is The Hon. Mrs Elizabeth Shân Legge-Bourke LVO of Crickhowell. In December 2007 Powys was awarded Fairtrade County status by the Fairtrade Foundation. ^ POH-iss with the vowels of "goat" and "kit" or POW-iss, with the vowels of "mouth" and "kit"
^ Sally Williams. "FairTrade Resource Network". Retrieved 3 July 2008. ^ "Wales Rally GB heading to Mid Wales". Shropshire Star. 5 November 2015. ^ "Sarn Sabrina Walk". Llanidloes Mid Wales. Retrieved 6 October 2012. ^ Hopkins, Adele (17 April 2009). "Sarn Sabrina Walk 2009". Mid Wales Walks. BBC. Archived from the original on 23 June 2012. Retrieved 6 October 2012. ^ "Severn Way". Long Distance Walkers Association. Retrieved 21 March 2010. Aberhafesp is a small village and community in Montgomeryshire, Powys, Wales. It is situated about five miles west of Newtown on the B4568 close to the River Severn.The church of St Gwynog dates back to the 13th century but was largely rebuilt in 1857. Brecon (; Welsh: Aberhonddu pronounced [ˌabɛrˈhɔnðɪ]), archaically known as Brecknock, is a market town and community in Powys, Wales, with a population in 2001 of 7,901, increasing to 8,250 at the 2011 census. Historically it was the county town of Brecknockshire (Breconshire); although its role as such was eclipsed with the formation of the County of Powys, it remains an important local centre. Brecon is the third-largest town in Powys, after Newtown and Ystradgynlais. It lies north of the Brecon Beacons mountain range, but is just within the Brecon Beacons National Park. Crickhowell (; Welsh: Crug Hywel pronounced [krɨɡˈhəu̯ɛl], also spelled Crughywel, or Crucywel) is a small town and community in southeastern Powys, Wales between Abergavenny and Brecon. Previously in the historic county of Brecknockshire. Dyfed–Powys Police (Welsh: Heddlu Dyfed–Powys) is the territorial police force responsible for policing Carmarthenshire, Ceredigion and Pembrokeshire (which make up the former administrative area of Dyfed) and the unitary authority of Powys (covering Brecknockshire, Radnorshire and Montgomeryshire), in Wales. The territory it covers is the largest police area in England and Wales, and the third largest in the United Kingdom, after Police Scotland and the Police Service of Northern Ireland. The force's headquarters are located in the town of Carmarthen. The force was formed in 1968, with the merger of the Carmarthenshire and Cardiganshire Constabulary, Pembrokeshire Constabulary and the Mid Wales Constabulary. The Dyfed–Powys region has over 350 miles of coastline and many remote rural communities – yet also a number of old industrial areas that are currently experiencing significant change and redevelopment. Despite the size of the area, the population is under 500,000, although it is boosted each year with large tourist numbers. The small population is reflected in the size of its workforce; 1,159 full-time police officers, 98 Special Constables and 140 Police Community Support Officers (PCSOs), 38 designated officers and 589 police staff. It is the eleventh smallest police force in the United Kingdom in terms of number of police officers. Glantwymyn (Welsh pronunciation) is a community in the northwest (Montgomeryshire) of Powys, Wales. The office of High Sheriff of Powys was established in 1974 as part of the creation of the county of Powys in Wales, replacing the shrievalties of the amalgamated counties: High Sheriff of Montgomeryshire, High Sheriff of Radnorshire and High Sheriff of Brecknockshire. This is a list of High Sheriffs of Powys. The Kingdom of Powys was a Welsh successor state, petty kingdom and principality that emerged during the Middle Ages following the end of Roman rule in Britain. It very roughly covered the top two thirds of the modern county of Powys and part of the West Midlands (see map). More precisely, and based on the Romano-British tribal lands of the Ordovices in the west and the Cornovii in the east, its boundaries originally extended from the Cambrian Mountains in the west to include the modern West Midlands region of England in the east. The fertile river valleys of the Severn and Tern are found here, and this region is referred to in later Welsh literature as "the Paradise of Powys". Knighton (Welsh: Tref-y-clawdd [trɛvəˈklauð] or Trefyclo) is a small market town and community in central Powys (previously Radnorshire), Wales, on the Teme and the Wales-England border. A small part of the town including Knighton railway station is in Shropshire, England. This Anglo-Saxon settlement later became a Norman fortified town. Powys is divided into two constituencies of the House of Commons of the UK Parliament (Westminster), which are also used for elections to the National Assembly for Wales. The current boundaries have been effective since the Welsh Assembly election, 2007 and the 2010 UK general election.Powys is one of the eight preserved counties of Wales, and has the name and boundaries of one of the 22 principal areas. For Welsh Assembly elections, constituencies are grouped into additional member electoral regions, and changes to constituency boundaries mean, also, changes to regional boundaries. See the list of places in Wales for places in other principal areas.This is a list of towns and villages in the principal area of Powys, Wales. Llanllwchaiarn (more usually spelt Llanllwchaearn in Welsh) is a village on the outskirts of Newtown in Powys, Wales. It forms part of the community of Newtown and Llanllwchaiarn. Aberbechan Hall was a Tudor mansion in the eastern part of the parish demolished in 1870. The wards of Llanllwchaiarn North and Llanllwchaiarn West elect up to four councillors to Newtown and Llanllwchaiarn Town Council. Montgomery (Welsh: Trefaldwyn; translates to the town of Baldwin) is a town and community in the Welsh Marches, administratively in the Welsh county of Powys. It is the traditional county town of the historic county of Montgomeryshire to which it gives its name. The town centre lies about 1 mile (1.6 km) west of the English border. Montgomery Castle was started in 1223 and its parish church in 1227. Other locations in the town include The Old Bell Museum, the Offa's Dyke Path, the Robber's Grave and the town wall. The large Iron Age hill fort of Ffridd Faldwyn is sited northwest of the town and west of the Castle. In the 2011 census, the community of Montgomery had a population of 1,295. Newtown (Welsh: Y Drenewydd), the largest town in the county of Powys, Wales, lies on the River Severn in the community of Newtown and Llanllwchaiarn, within the historic boundaries of Montgomeryshire. It was designated a new town in 1967 and saw large population growth as firms settled, changing its market town character. Its 2001 population of 12,783 eased to 11,357 at the 2011 census. It is known as the birthplace of Robert Owen in 1771, whose house stood on the present site of the HSBC Bank. The town has a theatre, Theatr Hafren, and a public gallery, Oriel Davies, displaying contemporary arts and crafts. It is known for housing the treasures that were brought home by Robert Clive and his son, Edward Clive from India. The Clives "looted" them during their service with the British East India Company.The castle has also been known as Castell Coch, Castell Pool, Castell Pola, Castell Pole, Castell Trallwng, Red Castle, Redde Castle and Castel Cough.The seat of the Earl of Powis, the castle is known for its extensive, attractive formal gardens, terraces, parkland, deerpark and landscaped estate. The property is under the care of the National Trust. Powys is the largest administrative county in Wales. With over a quarter of Wales's land area, covering much of the eastern half of the country, it is a county of remote uplands, low population and no coastline. It was created in more or less its current form in 1974, and is the only one of the large county units created at that time to have been carried forward intact at the 1996 local government re-organisation. It comprises three historic counties, namely Montgomeryshire, Radnorshire, and most of Brecknockshire. There are 950 Scheduled monuments within the county. This is far more than can be sensibly covered in one list, so each of the 3 historic counties is therefore listed separately, and each of these has two lists - one for the prehistoric sites and one for the Roman, medieval and post-medieval sites. Ystradgynlais (Welsh: [ˌəstradˈɡənlais], English: ) is a town on the banks of the River Tawe in southwest Powys, Wales, and is the second largest in the principal area and county of Powys. It is in the historic county of Brecknockshire.